Panforte, or Sienna Cake as it is often known, is a handy thing to have in the fridge over the Christmas season. It keeps really well in the fridge tightly wrapped in foil. Sliced into thin slivers and served with an after dinner coffee, it’s a delicious finish to a meal or a delightful addition to a petit fours plate. Always well received as gifts, I save large tuna cans and fill them with a ¼ of the mixture for a reasonably economical present. Preheat the oven to 150 degrees Celsius. Line a round sandwich tin with baking paper, both base and sides. Combine the nuts, dried fruit, flour, cocoa and cinnamon. Set aside while you prepare the sugar mixture. In a large heavy based saucepan, gently warm the honey and granulated sugar. Bring to the boil and simmer until a few drops of the toffee mixture dropped off the end of a spoon into a glass of cold water forms a soft, squishy ball of toffee. Drop in the chopped chocolate, turn off the heat and stir until the chocolate is melted. 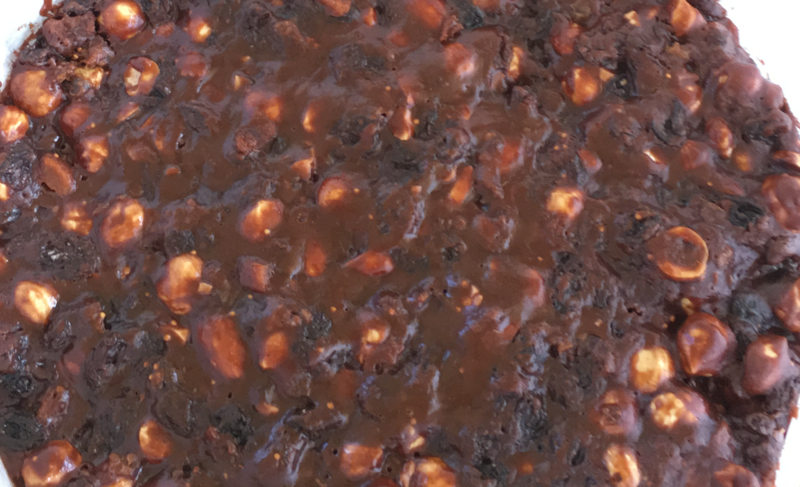 Add the dry ingredients to the chocolate toffee mix and stir to combine with a strong wooden spoon. The mixture is difficult to work with and you need to move quickly before the mixture cools. Once all the flour is mixed in, scrape the mixture into the paper lined tin and spread out evenly. If you find it too difficult to work, you can run your hands under the cold tap, shake off the excess moisture then press out using your damp hands to an even level surface. Bake in the pre-heated oven for 30 to 35 minutes, or until the panforte is set and firm to the touch. Cool in the tin and then dust liberally with icing sugar before serving.